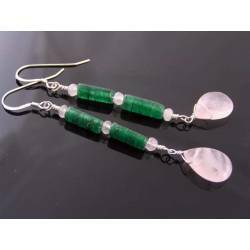 Very cute delicate heart ear wires suspends shiny sterling silver beads and high quality rhodochrosite drops. This is rhodochrosite imported from Peru with a great gel quality and no black or white inclusions. Total length is just under 3cm.